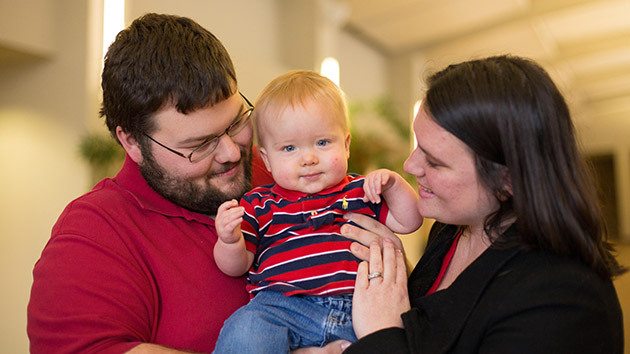 On what was supposed to be an exciting day of finding out whether they would have a boy or girl, Carolyn and Brad's baby was diagnosed with spina bifida, a disabling birth defect of the spine, and they were told he may never walk. As any parents would be, Carolyn and Brad were shocked. Then a few weeks after this diagnosis, they were told their baby boy, Cooper, had another condition — hydrocephalus, fluid buildup on the brain. The doctors told them Cooper would possibly be bound to a wheelchair and mentally handicapped. They were confused, scared and concerned for their baby. They couldn’t understand why this was happening, but God used this time to strengthen their faith and show them His miracles. Carolyn and Brad found encouragement in Scripture. They began to proclaim that even though they didn’t understand what was going on, God did. They were able to give it all over to God and let Him handle it. Whatever challenges they faced, they were confident God was going to help them through it. Even in the midst of these struggles they experienced strength and peace, and they were excited about their son’s birth. As time went on, God showed them His faithfulness. Cooper was born on December 10, 2012, a few weeks early because of complications from the spina bifida. After his birth, he had surgery on his spine and stayed in the neonatal intensive care unit for three weeks. Though they spent Christmas in the hospital, the best Christmas gift they received was being able to take him home on New Year’s Day. Cooper still had a few challenges after leaving the hospital, but now, each time they go to the doctor, they receive a good report. They were given the good news he will be able to walk and all his movements are fine. He can roll over and kick and is doing great. Cooper is the happiest, most joyful baby and melts their heart each time he laughs. Carolyn and Brad stand firm that their trust in God got them through this trying time. Their prayer life increased and their faith strengthened. They are confident of God’s work in Cooper and praise Him for His miracles!